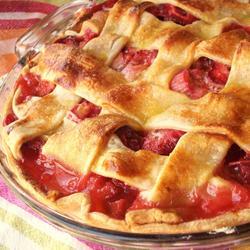 Fill tart or pie shells with cream and top with fruit. Layer cream into parfait glasses with fruit, cake, cookies, chocolate, nuts, etc. Use cream to fill cakes, éclairs, doughnuts, cream puffs, etc. 1. In medium bowl, mix together sugar and cornstarch. 2. Whisk eggs into sugar mixture and set aside. 3. In heavy 2-quart saucepan, heat milk just to boiling. Lower heat. 4. Stir a little hot milk into egg mixture to warm the eggs. Whisk well. 5. Slowly whisk egg/sugar mixture into hot milk and slowly cook to a boil. Cook a minute more – the cornstarch will thicken the cream. 6. Remove pan from heat and stir in butter and vanilla. Use immediately or refrigerate. 1. 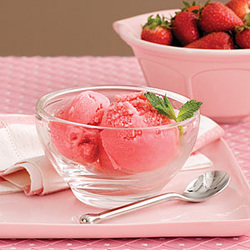 Process strawberries in a food processor or blender 30 seconds or until smooth, stopping to scrape down sides. 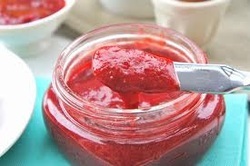 Pour strawberry puree through a fine wire-mesh strainer into a large bowl, pressing with back of a spoon. Discard solids. Add buttermilk, sugar, and vanilla to puree; stir until well blended. Cover and chill 1 hour. 2. Pour strawberry mixture into freezer container of a 1 1/2-qt. electric ice-cream maker, and freeze according to manufacturer's instructions. (Instructions and times may vary.) Garnish, if desired. *1 (16-oz.) package frozen strawberries, thawed, may be substituted. Combine the sugar, lemon zest, and lemon juice in a small saucepan and cook over very low heat for 10 minutes, until the sugar is dissolved. Add the strawberries and continue to cook over very low heat for 20 minutes, until the strawberries release some of their juices and the mixture boils slowly. Cook until a small amount of the juice gels on a very cold plate. (I keep one in the freezer.) Pour carefully into 2 pint canning jars and either seal or keep refrigerated. Use immediately, or follow proper canning guidelines below. To sterilize jars, before filling with jams, pickles, or preserves, wash jars and lids with hot, soapy water. Rinse well and arrange jars and lids open sides up, without touching, on a tray. Leave in a preheated 175 degree F oven for 25 minutes. Or, boil the jars and lids in a large saucepan, covered with water, for 15 minutes. Use tongs when handling the hot sterilized jars, to move them from either boiling water or the oven. Be sure the tongs are sterilized too, by dipping the ends in boiling water for a few minutes. 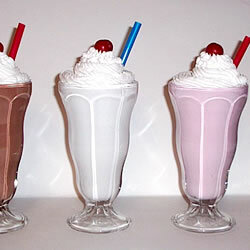 In a blender combine strawberries, ice, milk, ice cream and sugar. Blend until smooth. 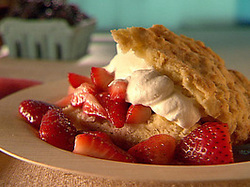 "There's plenty of sweet berry flavor in this refreshing dessert. 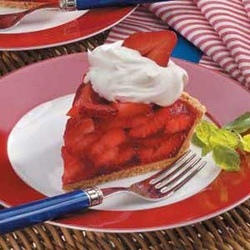 Made with sugar-free gelatin and a graham cracker crust, the summery pie is easy to fix and attractive enough to serve to guests." Cut reserved strawberries in half. Garnish each serving with whipped topping and a berry half. Yield: 8 servings.